Looking to wipe sensitive files from USB flash drive? Do you want to dispose off your old USB drive? Need to find a solution to wipe USB drive data so that it should not be misuse by other person...don’t panic? USB Drive Sanitizer is what you are looking for. It is an appropriate solution to wipe USB drive files beyond recovery by any file recovery tool. By using, some globally recommended wiping methods it will surely wipe complete data from USB and other flash memory drives. Wiping USB drive becomes essential when you are looking to sell out your old USB drive. Some people mostly purchase old data storage drives in order to recover personal data from them, which can be misused later. Even if you had formatted your USB drive, there are still possibilities of data recovery. Hence, to safeguard your private and confidential files you should use permanently wipe data software. 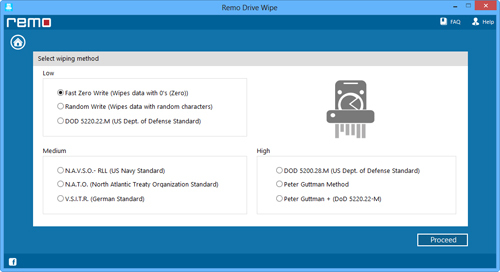 These wiping methods overwrite your complete USB drive data with some garbage values. Therefore, if anyone will try to recover files from your USB drive using undelete utilities he will only get this trash. Data security is very important now days. Some maliciously minded people could use your sensitive data for making money. You must be having some personal photos, bank account details, important documents, etc on your USB drive. Simply deleting them is not a complete solution. 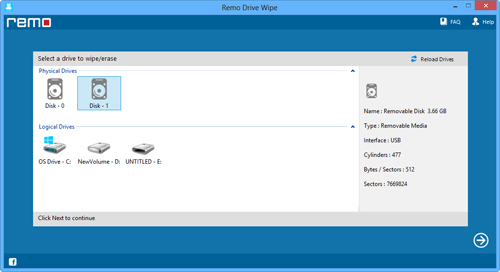 Before disposing off your USB drive, make sure to use drive wipe software. In case you are using any external USB drive, then this software is recomended by industry experts as it allows you to erase Seagate external hard drive data along with other external USB devices with ease. This utility is comfortable and easy to use. To protect your important files from misuse, this application can be used so that it can wipe SanDisk memory card and keep your confidential data safe. Because if someone gets it then he can misuse the contents present there by recovering it with file recovery software. It can also wipe Memory Stick of different brands like Memory Stick Duo, Memory Stick Pro, Memory Stick Micro, Memory Stick PRO-HG, Memory Stick Micro M2, etc. This software is a disk sanitizer for Windows 7, XP, and Vista. You can download its free trial version and wipe USB or any other data storage drive. The trial version will have three wiping methods and if you want all nine wiping methods, you can purchase the software and get benefit of all wiping methods. Moreover, you will even get free 24 by 7 technical support for all your queries, which you will not get with trial version. Perform following steps for wiping sensitive data from your USB drive. Step 1: Install the Hard Drive Wipe software on your Windows PC and double click on desktop shortcut for launching the program. Now connect USB drive to your PC. On program’s main screen, select USB drive and press "Next" as shown in Figure A. Step 2: Select any one of the nine wiping method and press "Next" as shown in Figure B. You can even go back by clicking on "Back" button if you do not want to wipe this USB drive. After successful wiping of USB drive, software will show you a message stating that the particular drive was successfully wiped.